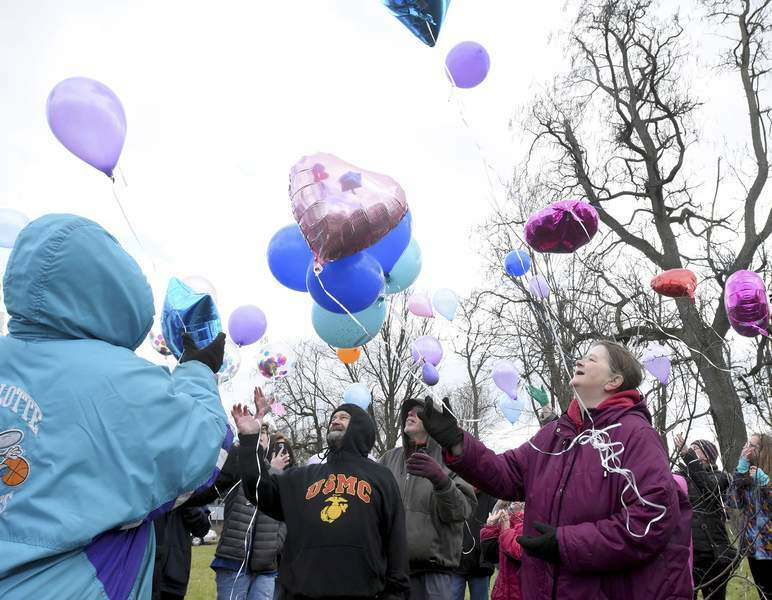 Photos by Rachel Von | The Journal Gazette Janet Tinsley, right, mother of April Marie Tinsley, releases balloons along with others gathered at Hoagland and Masterson avenues Wednesday to remember the 8-year-old girl, who was killed in 1988. Rachel Von | The Journal Gazette Guests talk and blow up balloons during a Balloon Release event at the corner of Hoagland Ave. and W. Masterson in memory of April's death on Wednesday April 4, 2018. April Marie Tinsley was killed in 1988 by an unknown assailant. Tinsley talks with retired Detective Dan Camp at the site, where a memorial has been built. It's near where the Tinsleys lived 30 years ago. 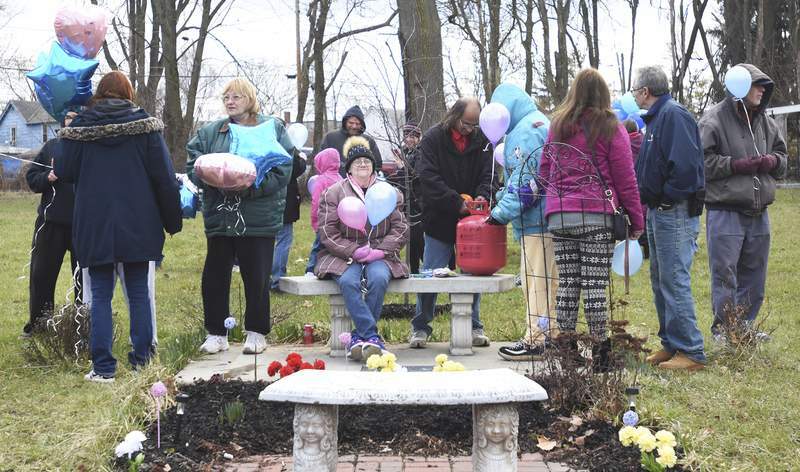 Janet Tinsley, mother of an 8-year-old killed 30 years ago, stood in front of the little girl's angel bench Wednesday with the retired Fort Wayne police detective who still follows the case. She and that detective, Dan Camp, met for a balloon release at the southwest corner of West Masterson and Hoagland avenues, close to where Tinsley and her family lived at the time of her daughter April's abduction. Neither has given up hope that the man responsible for April's death will be caught. About 70 people, including law enforcement, neighbors, family and representatives from new local activist groups #FlipThisCity and #JusticeFor Malakai, came to send balloons skyward and give the Tinsleys hope that justice will someday come. 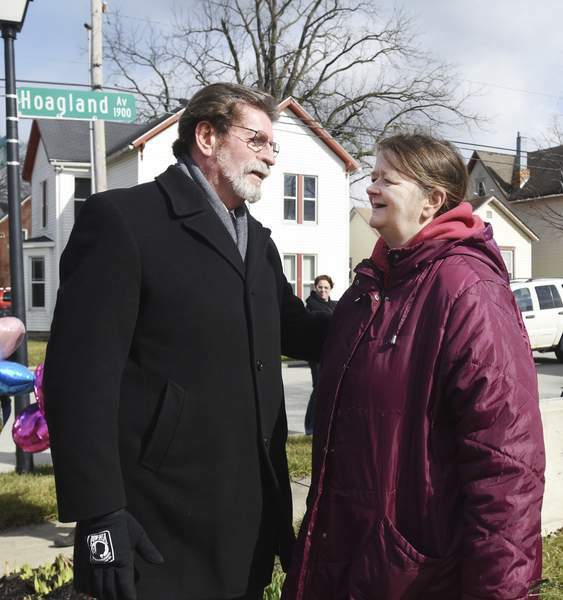 The corner is close to where April disappeared, and about three years ago, the Hoagland-Masterson Neighborhood Association decided to create a memorial to April, Tommy Goings said. Jim Obergfell, owner of the vacant corner property and a neighbor, offered the land. Goings, who lived in the neighborhood when April was taken, took on the project and said that within days, two corporate sponsors stepped up. Current Mechanical donated $500, and Stuckey's Greenhouse provided the angel bench, some other garden decor and plants. “Within a week, everything was taken care of,” Goings said. “It was all from the heart.” Brick pavers lining the path to the bench and headstone were sold at cost for $20. Prospects may be dim when it comes to catching the killer or killers of April, who disappeared April 1, 1988. Witnesses said they saw a man force a girl into a beat-up blue pickup truck with loud pipes. April, who was sexually assaulted before being suffocated, was found dead three days later in a ditch in DeKalb County, discovered by a jogger. Years of DNA tests, leads and mysterious handwritten notes have not led to the killer, who could even be dead, Tinsley and Camp conceded. But her abduction and death so shook the area that the case continues to have widespread recognition. Mike McAlexander, Allen County deputy chief prosecutor, said the prosecutor's office continues to investigate the case 30 years later. Deputy Chief Garry Hamilton, who attended the balloon release, said he'd grown up on East Masterson Avenue, not far from April's Garden, as it is called. People often drop by the garden to pay their respects, according to Renee Procise, who comes to tend the garden with Goings. She plans to add more pink surprise lillies; pink was one of April's favorite colors. Daffodils will soon bloom.